The City of Pickering is growing and so are its electricity needs. 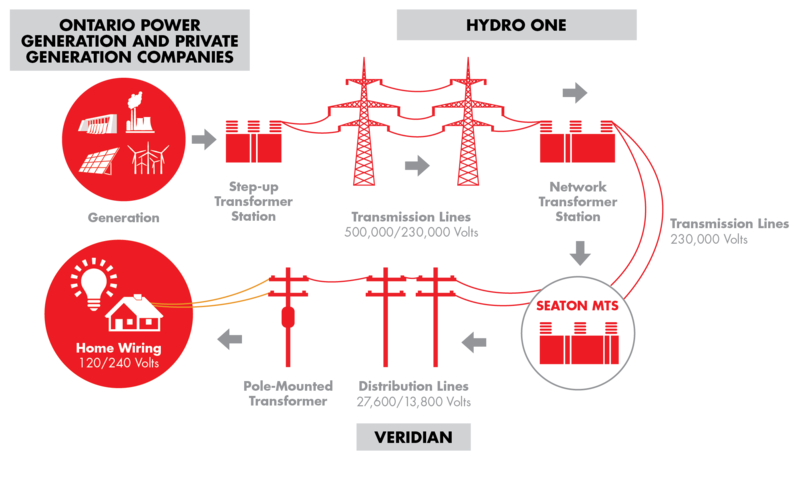 To meet the forecasted electricity demands in North Pickering, Veridian Connections (Veridian) is working with Hydro One to ensure a safe and reliable supply of power. Together, Veridian and Hydro One are updating the Class EA Study to plan for the construction of the new station and its connection to Hydro One’s high voltage system. The revised study will evaluate and determine a preferred location for the proposed transformer station, and the associated transmission line connection. As we launch into the updated Class EA process, we encourage you to learn more about how this project will benefit the City of Pickering and the opportunities for public involvement. The construction of Seaton MTS will ensure a reliable supply of power is available to support future growth of homes and businesses in the North Pickering area. Upgrading components such as the insulators and conductor (wire) on a section of Hydro One’s existing 230 kV transmission line. The construction of a tap line to connect the station to the existing 230 kV transmission line. 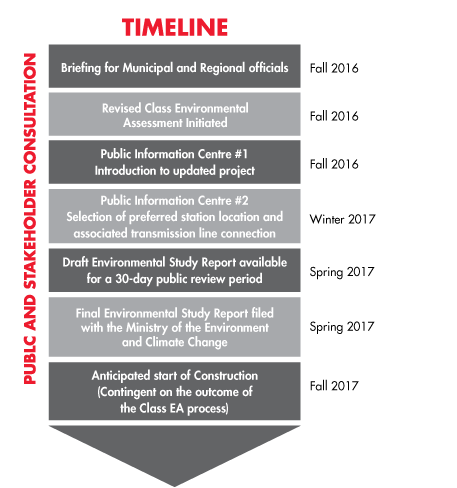 Public consultation is an integral component of the Class EA process. Veridian and Hydro One provides early notification of proposed undertakings to the government agencies, municipal officials, First Nations and Métis communities, potentially affected property owners, and other local stakeholders, and we maintain a project contact list to keep interested parties informed and engaged throughout the study process. Veridian and Hydro One will host a second Public Information Centre (PIC) on March 2, from 6:30 to 8:30 p.m., at Veridian’s corporate headquarters in Ajax. The PIC is being held to share information about the proposed project and to gather feedback from community members. 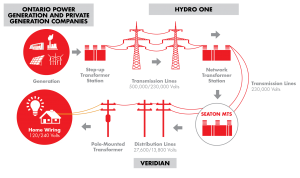 Veridian and Hydro One held its first PIC on November 2, 2016. The Seaton MTS project is subject to the provincial Environmental Assessment Act. The project is being planned in accordance with the approved Class EA for Minor Transmission Facilities. The Class EA was developed as a streamlined process to ensure that minor transmission projects that have a predictable range of effects are planned and carried out in an environmentally acceptable manner. Consultation with elected officials, municipal representatives, government agencies, First Nations and Métis communities, interest groups and the public is an important part of the Class EA process. In addition to organized consultation opportunities, Veridian and Hydro One welcomes input at any time throughout the project. 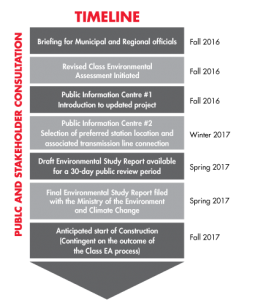 As part of the consultation process, a draft Environmental Study Report (ESR) will be made available for a 30-day public review and comment period. Details of the review process will be communicated through various channels, including local newspapers, this project website and via notifications to project stakeholders. The proposed station sites and associated line taps in the study area are located on Ministry of Infrastructure (MOI) owned lands. The MOI land holdings that may be impacted by this undertaking will also be evaluated through the Class EA process to satisfy the requirements of the MOI Class EA for Public Works. Additionally, depending on the station site selected, approval from the Ontario Energy Board under Section 92 of the Ontario Energy Board Act, 1998 may also be required.